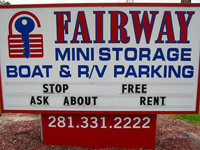 At Fairway, we meet the growing needs of consumers and businesses to make the best use of shrinking living and working space by offering affordable and safe off-site storage facilities for personal and business use. Today, we act as an extra closet, garage, and warehouse for home owners, renters, and businesses through our modern facility in Alvin, Texas. We are recognized by our customers and by the self storage industry as a leader in providing self storage facilities that are highly safe, convenient, clean, and affordable. We have lots of different features to our storage spaces like climate controll and electronic gate access. Check out our sizes to determine which self storage space will best suit your needs.